If you are starting your own bonsai or potting for the first time, here are some things to keep in mind. 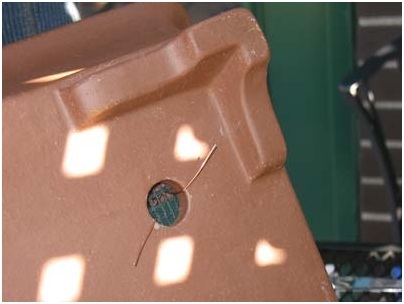 Make sure that you are using an appropriate soil medium (see page on soils) to plant your bonsai in and make sure that the pot has adequate drainage holes. Once you have established that, prepare the pot by cutting square or rectangular pieces of mesh that are just slightly bigger than each hole and placing them over the holes. If you have many holes in a row, you might find it easier to use larger pieces of mesh. 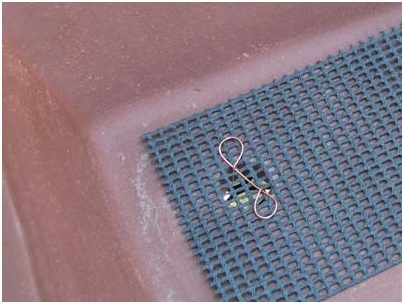 Once secured, the mesh will prevent soil from being washed out as you water. Next, secure the mesh to the pot by taking a piece of wire and folding it into two loops with a short tail at the end of each loop. Bend the tails downward and insert them through the mesh and then through a drainage hole so that the loops are inside the pot and the tails hang below the pot. Now bend the tails upward to secure the mesh in place. Repeat this for each drainage hole. The next step is to cut a long piece of wire that will enter from the bottom of the pot through two drainage holes (the two farthest away from each other). This wire is called the anchorage wire; it will be used to secure the trees roots to the pot. Now comes the critical part. You will now need to remove your tree from its current container and using a root hook or a chopstick, try to remove as much soil as possible while detangling the root mass. Do not worry too much about breaking some roots; you will most likely need to trim many of them off anyways, but remember to never cut off more than 1/3rd of the root mass at one time. Doing so might result in the tree stressing out and dying. Once you have separated the roots, you will need to trim them. Holding the tree in a tilted position, cut off the heavy roots underneath the root ball (the vertically pointing ones). This will allow you to comfortably place the tree in a shallow bonsai pot. Continue shortening any thick roots and trim fibrous ones to encourage new growth of a compact root system. Once that is done, you can now add some potting medium to the pot and place the tree on top. Secure the tree with the anchorage wire and fill the rest of the pot with potting medium, making sure to add the medium in between the roots. Pat the medium down and you are done! Don’t forget to water the tree thoroughly! 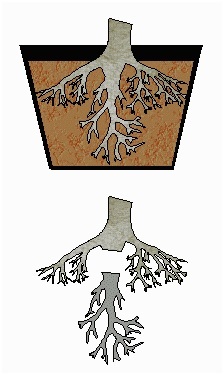 A bonsai must be periodically repotted to supply a pot-bound root system with fresh soil. It is also necessary to keep the root system in balance with the top growth. Most bonsai require repotting every two or three years. This depends on the growth of the tree and also on the size of the pot. Repotting should be done in the early spring, but do not fertilize for 3-4 weeks after repotting. Do not let the roots go dry while repotting and water the tree thoroughly when finished. For the process of repotting, follow the same procedure as for potting for the first time.